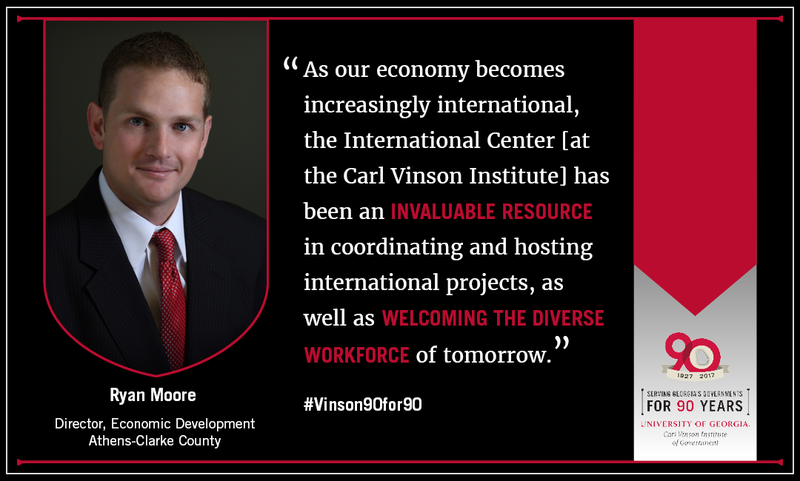 The Carl Vinson Institute, and in particular the International Center, have been a tremendous resource for our economic development efforts. As our economy becomes increasingly international, the International Center has been an invaluable resource in coordinating and hosting international projects, as well as welcoming the diverse workforce of tomorrow. Taesik Yun and Rusty Brooks are true assets to our programming. They are always willing to think creatively and to help provide a world-class experience to our international visitors. The International Center's connections to their partner countries are a selling point in our community. The flow of international visitors makes our community more interesting, and our workforce more diverse, increasing our quality of life, and adding to the appeal of our community as a destination for foreign direct investment. As a short-term visiting scholar during August 2015 – February 2016 researching public finance reform. All of them, Dr. Rusty Brooks, Tracy Arner, Fei Zhang and Hong Zeng, etc. are very kind and have professional dedication. I've benefited a lot from them, especially from Rusty and Tracy's instruction and assistance in my research. They have all become my good teachers and friends. Long history, outstanding prestige in government staff training, research and consulting work, etc., similar work fields as our institute. Our Institute has decided to establish cooperative relationship with the Carl Vinson Institute of Government after Mr. Fei Zhang's visit. Two professors have been sent to be visiting scholars [at the CVIOG]. The research results have been adopted in my lectures and papers. Hope our two institutes can have more cooperation in training programs, policy consulting and other fields. Congratulations to Carl Vinson Institute of Government. 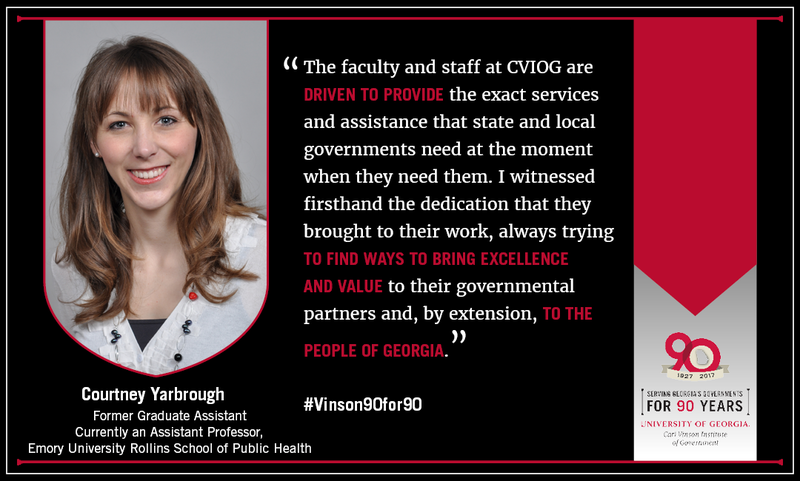 What is/was the primary focus of your work with the University of Georgia's Carl Vinson Institute of Government? I have been working on a variety of research projects and organization management. This includes things like upcoming conference planning, researching GI Bill benefits, researching the history of GDOT [Georgia Department of Transportation], developing project management documents and developing a training spreadsheet tracker. It has been very interesting so far and I look forward to doing more! I am grateful for the opportunity to work with Mara [Shaw] and CVIOG. I was familiar with CVIOG from my previous work. Since getting settled in, my expectations for the Assistantship and being a part of the CVIOG team have been exceeded. Everyone is extremely professional. I have also been very impressed with the variety of projects and programs all CVIOG faculty and staff handle. Everyone is clearly passionate about public service and providing high quality programs. My background is in economic development and local government planning. The opportunity to work at CVIOG will build upon my current skill set and better prepare me for tackling new challenges in the future. 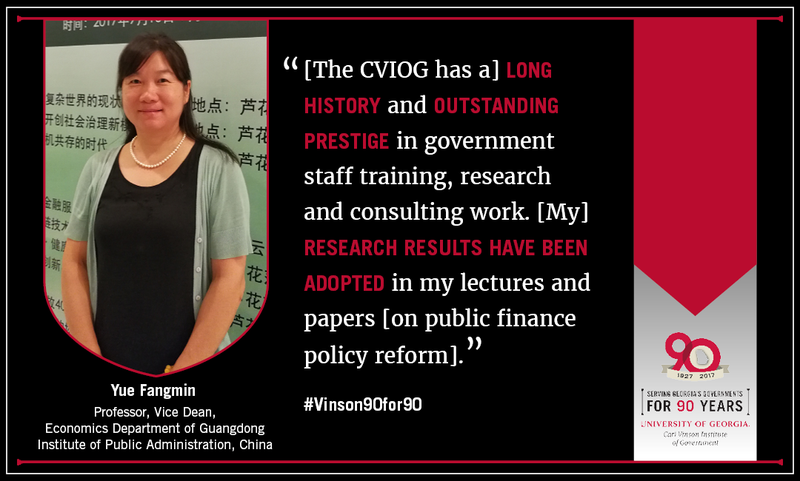 During my time at CVIOG, my work ranged from assisting with administrative tasks to research on state and regional projects. My work primarily focused on workforce development projects. I interviewed CTAE teachers and district-level administrators to get their input on what makes an effective and useful advisory committee. This information was used to develop a statewide Advisory Committee Training program, and I assisted in developing the pilot training course. I also wrote case studies about unique public-private partnerships across the state that involved businesses, high schools, and technical colleges enhancing career pipelines for young adults. Everyone at CVIOG is extremely knowledgeable and eager to help. My position at the Institute was my first public service position, so I was intimidated at first. But, that feeling quickly subsided. My supervisors supported me by keeping an "open-door" policy and answered any questions I may have had. My associate director, David Tanner, prioritized my professional development by involving me in training courses and client meetings. I enhanced my research, critical thinking, and data analyzing abilities throughout my time as a GRA. I've also gained valuable interpersonal skills when dealing with clients and partners, which is a skill I use daily. As a Management Fellow, I am constantly interacting with stakeholders in the community, and I believe that my experience at CVIOG has adequately prepared me to maintain a professional presence to represent my organization. I am very grateful that my first public service opportunity was with the State Services and Decision Support Division. 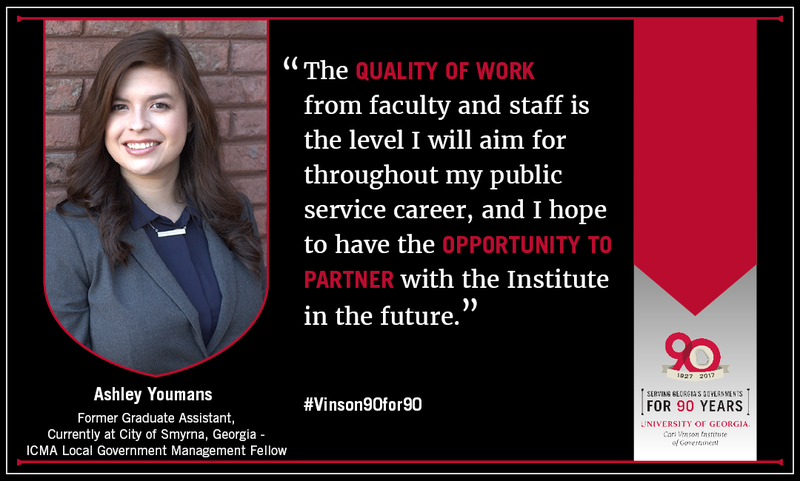 The quality of work from faculty and staff is the level I will aim for throughout my public service career and I hope to have the opportunity to partner with the Institute in the future. 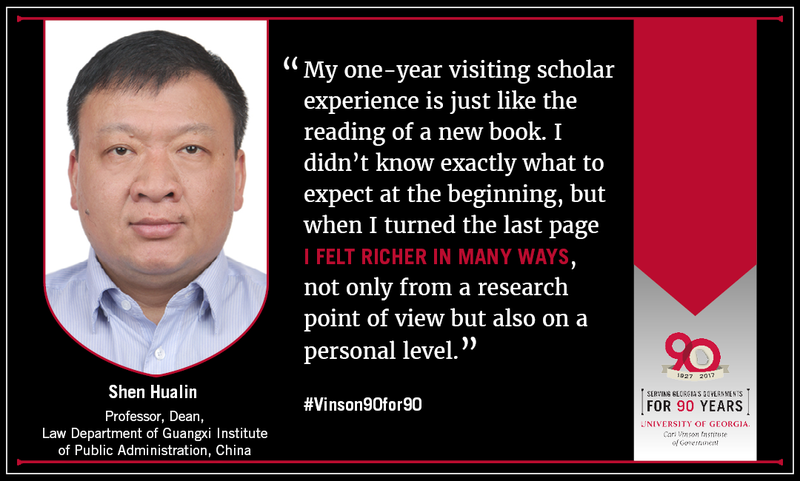 As a visiting scholar funded by China Scholarship Council from September 2014-2015. Research Project: The Public Governance in Regional Economic Integration and Institutional Arrangements of China - ASEAN Free Trade Area. The International Center, led by Dr. Rusty Brooks and with Fei Zhang and Hong Zeng as core members, is an innovation-oriented and project-tailored team. Indeed, the faculty of the International Center is not just a faculty, it is a lively community. A community who gathers together supportive, effective, experienced, caring and skilled educators. They are committed to making our research fruitful but also fun and enjoyable. My one-year-visiting scholar experience is just like the reading of a new book. I didn’t know exactly what to expect at the beginning, but when I turned the last page I felt richer in many ways, not only from a research point of view but also on a personal level. It is not just the reading of paper books, but also about reading American society as a book, just as an old Chinese saying goes that, " It is better to travel ten thousand miles than to read ten thousand books ." My time in UGA hasn’t been just writing and researching in well-furnished libraries, vibrant classrooms and seminars, but it has also, and above all, been creating bonds with American people during my journey of 50,000 kilometers around the United States. When I was a research assistant with the Local Government group in Governmental Services and Research, I conducted research on the local option sales tax, assisted with administering questionnaires to government entities for case studies, and helped compile the budget for a newly incorporated city. 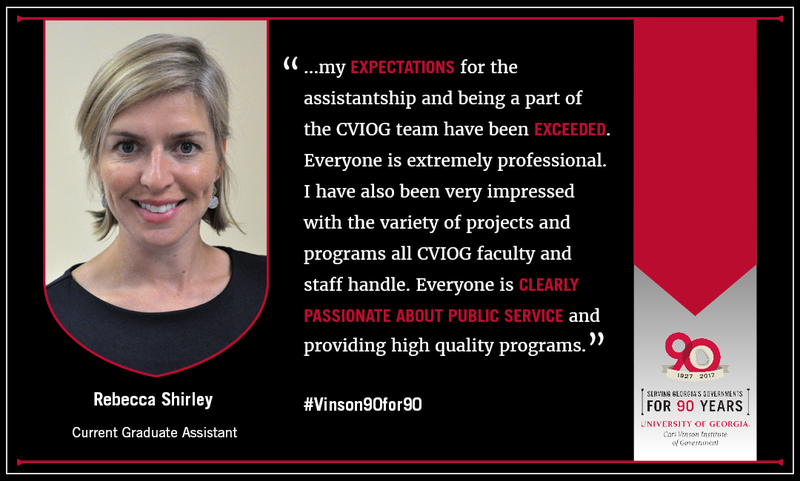 The faculty and staff at CVIOG are driven to provide the exact services and assistance that state and local governments need at the moment when they need them. I witnessed firsthand the dedication that they brought to their work, always trying to find ways to bring excellence and value to their governmental partners and, by extension, to the people of Georgia. By working at CVIOG, I learned how to listen to partners on the ground and adapt my projects to practical needs and real-world objectives. At CVIOG, research always serves a clear purpose—to provide useful answers to important questions. This approach leads to better policies and improves the lives of people. In my current research, I try to keep practical goals in sight and do work that will lead to better health policy. 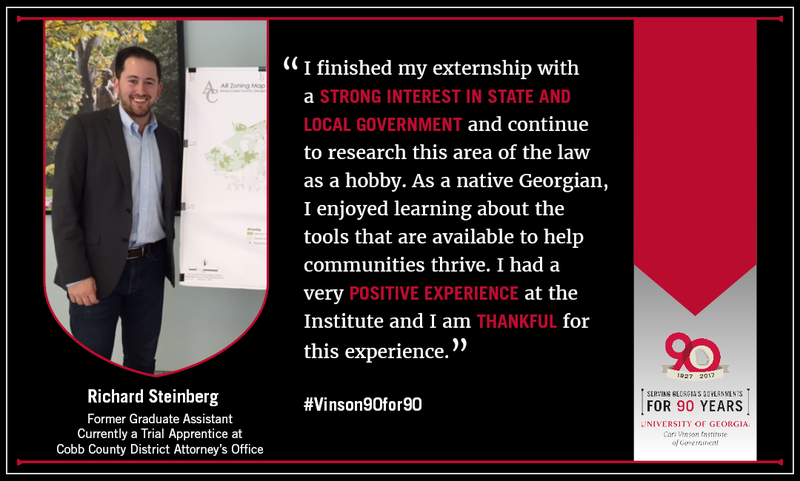 The state of Georgia is fortunate to have the Vinson Institute, where governments large and small can have access to objective, sophisticated and in-depth research and technical assistance resources. 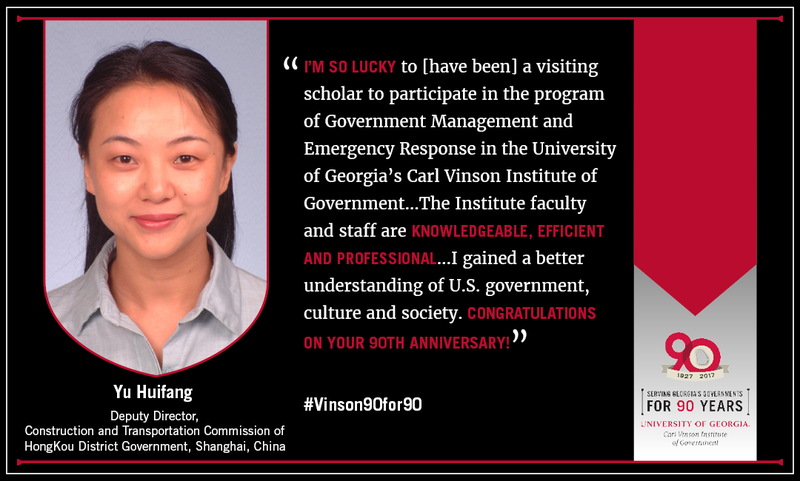 I’m so lucky to [have been] a visiting scholar to participate in the program of Government Management and Emergency Response in the University of Georgia's Carl Vinson Institute of Government from August 2014 to February 2015. The Institute faculty and staff are knowledgeable, efficient and professional. Elegant and warm-hearted Laura Meadows, knowledgeable Rusty Brooks, Superman-invincible Fei Zhang, beautiful and efficient Hong Zeng, etc. All of them helped me a lot. I audited Master of Public Administration (MPA) lectures, made official visits, site visits, and attended conferences, etc., through the program of Government Management and Emergency Response. I gained a better understanding of U.S. government, culture and society. Congratulations on your 90th Anniversary! 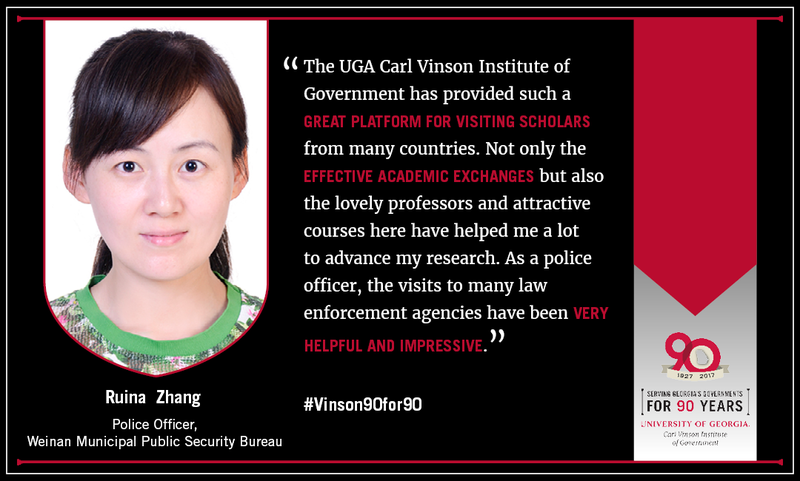 The UGA Carl Vinson Institute of Government has provided such a great platform for visiting scholars from many countries. Not only the effective academic exchanges but also the lovely professors and attractive courses here have helped me a lot to advance my research. As a police officer, the visits to many law enforcement agencies have been very helpful and impressive. I really appreciate the arrangement of CVIOC. The Institute faculty and staff are knowledgeable, professional, and enthusiastic. At the beginning of a new life here, Rusty Brooks, Fei Zhang, Hong Zeng and Sandrika Walker make me feel at home and welcome. They have offered academic guidance and helped me to adapt to university life better. The work of CVIOG plays an important role in my research. It helps me sum up the multiple ways to build a service-oriented public security organization on the basis of comparing the different police systems between China and the United States. The academic communication, the relevant visits and the splendid curriculum are beneficial for my future research. Thank you for having me as a visiting scholar in the CVIOG. I look forward to the future cooperation. Congratulations on your 90th Anniversary! Completed a project detailing the economic impact and workforce requirements for different industries in Georgia. When I started my fellowship at Carl Vinson, I was interested in education policy. I did not know or understand the purpose of the workforce policy field. 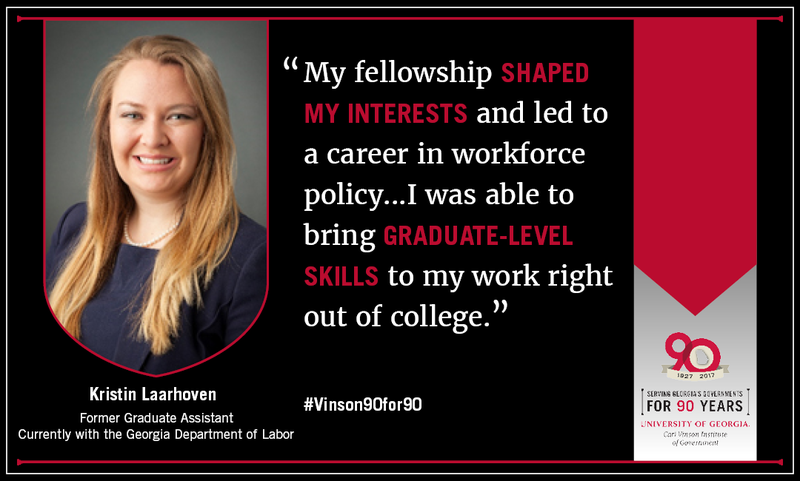 My fellowship shaped my interests and led to a career in workforce policy. I was taught how to conduct research and mine data at a much higher level than what was required in my undergraduate study at UGA. I was able to bring graduate-level skills to my work right out of college. I have also enjoyed working with Carl Vinson employees through my job. They have been consultants on many projects that I have worked on, and it is great to stay in touch. My most memorable project involved developing new marketing and branding tactics for Blairsville. So much time, creativity, and effort went into this one project from numerous staff members and it was a perfect example of how projects are conducted at CVIOG. It made me very proud to be a part of the organization knowing that each individual client (municipality) is given that much attention, no matter the size of their need. My internship at CVIOG was the most eye-opening experience I had throughout my schooling. The internship brought me out of my shell in terms of public speaking, broadened my knowledge on local governments and the ways in which they operate, exhibited numerous different types of leadership and introduced me to the art of facilitation. Most of all, my experience revolved around teamwork. 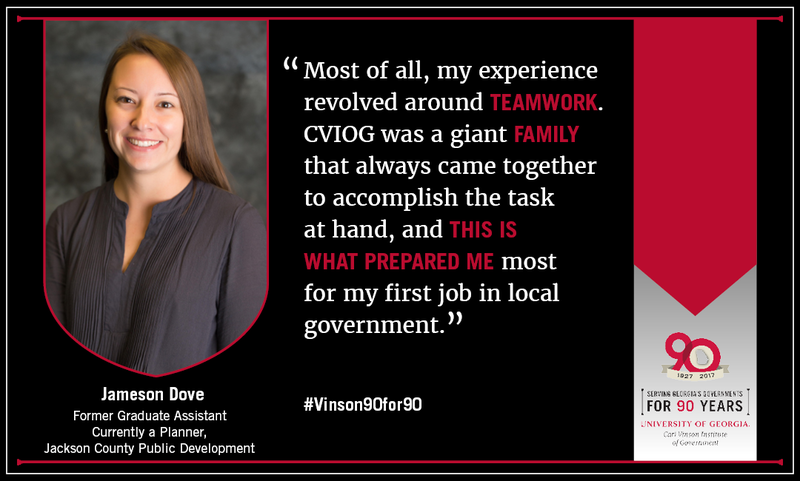 CVIOG was a giant family that always came together to accomplish the task at hand and this is what prepared me most for my first job in local government. I had the best experience working under the guidance of Gordon Maner and Mara Shaw. I can honestly say that I wouldn't possess some of the same skills or even the hard work ethic that I have today if it would not have been for the year I spent working for them. Thank you for everything! 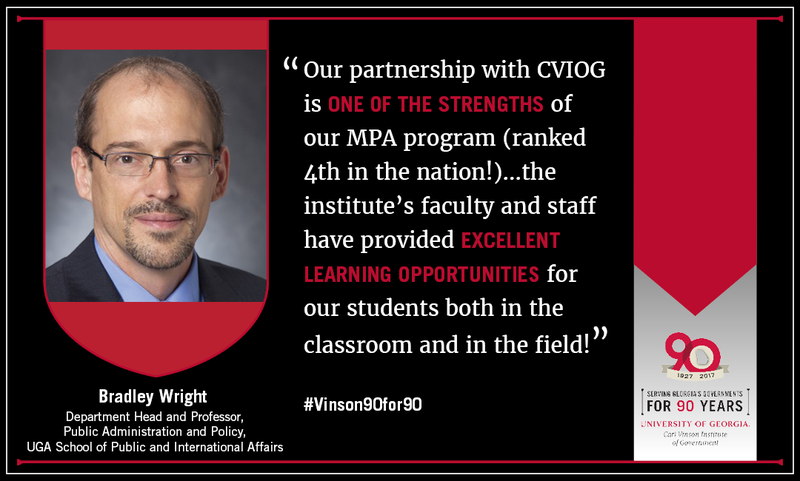 The UGA School of Public & International Affairs' Master of Public Administration (MPA) program is co-sponsored by the Carl Vinson Institute of Government. The MPA program at the University of Georgia is designed to develop professionals who can use their educational experiences to work productively at all levels of public sector management, as well as in research endeavors. The central purpose of the program is to educate students for professional careers in public service including management and policy analysis in government and nonprofit organizations. The program is open to students without previous public service experience as well as students employed in the public sector who are seeking to advance their careers. Over the past several decades, UGA has become a major center of excellence for public service education. A recent study in the Journal of Public Administration Education ranked the UGA Public Administration and Policy faculty first in the nation in research published in scholarly journals associated with the American Society for Public Administration. The most recent survey from the U.S. News & World Report (2016 edition) ranked the Georgia MPA program as fourth in the nation among all programs and second in the nation among programs at public colleges and universities. The program is fully accredited by the National Association of Schools of Public Affairs and Administration. utilizing Urban Redevelopment Law as an economic development tool. obtaining a Regional Economic Business Assistance Loan. understanding townships as a local form of government as employed by neighboring states and how they were similar to the township legislation proposed by the Georgia General Assembly. disclosure requirements for public economic development documents in neighboring states. understanding proposed government structures of the cities of South Fulton and Stonecrest. understanding Department of Public Health requirements for food truck construction and how they are enforced in various counties. I had the pleasure of working with Ted Baggett as both my supervisor at CVIOG and as my State & Local Government professor at the University of Georgia School of Law during the spring semester of my second year. Ted is very passionate about what he does, and I was excited to come to work every day and learn from him. I always recommend this externship and his class to new law students. What skills did you gain while working at the Institute of Government and how have they prepared you for your current or future employment? My legal writing improved tremendously through working at CVIOG. Ted always took the time to analyze my work and tell me how I could improve. Not everyone is willing to do that, but he cared about my development and I am appreciative of that. I finished my externship with a strong interest in state and local government and continue to research this area of the law as a hobby. As a native Georgian, I enjoyed learning about the tools that are available to help communities thrive. I had a very positive experience at the Institute, and I am thankful for this experience. 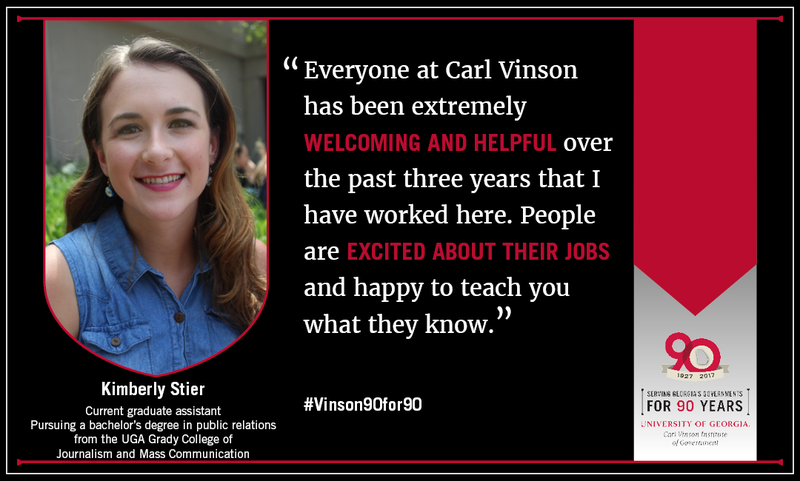 Everyone at Carl Vinson has been extremely welcoming and helpful over the past three years that I have worked here. People are excited about their jobs and happy to teach you what they know. I have learned time management and how to efficiently complete multiple projects at the same time. I have learned how to work effectively with other people both within Carl Vinson and outside of the Institute. I have developed stronger skills in both research and writing. These lessons have prepared me to be a successful and competitive candidate in the field of public relations.